Question 1: Thank you Mr. President, thank you for availing us of this opportunity to know your perspective of what is happening in Syria, and the future of this country. First of all, I have one question: now that the Astana talk nears, what do you seek and expect from this conference? President Assad: First of all, you’re most welcome in Damascus, and I am glad to speak to the Japanese audience for the first time during this war on Syria. We don’t have expectations, let’s say, we have hopes from Astana, that it’s going to be a podium for talks between different Syrian parties regarding everything, but I think it’s going to focus more at the very beginning – it’s going to be the priority, as we see it – is about the ceasefire in different places in Syria in order to protect lives, to allow the humanitarian aid to reach different areas in Syria. It’s not clear yet whether this meeting is going to be about any political dialogue, because it’s not clear who’s going to participate in it. So far, it’s about talking between the government and the terrorist groups in order to make ceasefire and to allow those terrorist groups to join the reconciliations in Syria, which means giving up your armaments and having amnesty from the government. This is the only thing that we can expect in the meantime. Question 2: And do you accept the formation of transitional government to be discussed in this conference? President Assad: Anything that will be discussed should be based on the constitution, because it’s not about the government and the opposition or the government and the terrorist groups; it’s about every Syrian citizen who has the right to define the future of Syria. So, in our constitution there’s nothing called transitional government. You can have regular government that represents different parties and different political entities in Syria. This is our proposition. So, yes, if anybody wants to join this government, what we call it national unity government, this is viable for every party outside or inside Syria, and after that government, you can talk about, let’s say, legislative elections or parliamentarian elections, that would be followed by another government later, which is based on the results of the elections. Question 3: New United States President Mr. Donald Trump is going to be inaugurated soon. What do you expect of Mr. Trump, and what kind of policy change do you expect from this? 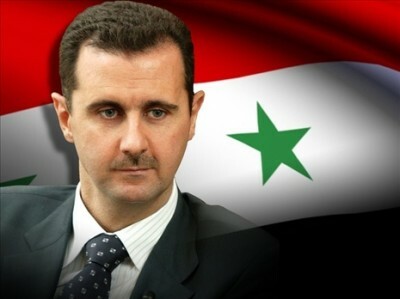 President Assad: As you know, he’s one of few American presidents that weren’t in politics before. Most of the previous presidents, they used to have certain kinds of political jobs or positions. This one is not so. If you read different media, even the American media, they look at him as unpredictable, because they know little about his vision. The only thing that we have that we can base our judgment upon is his rhetoric during the campaign, and if you want to pick up the thing that we can say that it’s good in those rhetorics is our priority today, which is fighting the terrorism, and that’s what he said, President Trump, he said that his priority is to fight ISIS. Of course, ISIS is one of the aspects of terrorism, one of the organizations; when you talk about ISIS you have to talk about al-Nusra, and you have so many Al Qaeda-affiliated groups now within Syria, but he meant by ISIS, I think, the terrorism, so I think this priority that he put is very important. So, we expect, and we hope, that the next administration will be genuine in implementing this rhetoric regarding the terrorism and help not only Syria, because the terrorism today is not a Syrian problem; it’s a Middle Eastern and global problem. So, we hope that they are genuine to forge a real and realistic alliance to fight the terrorists in the region, and that of course will include Syria first of all. Question 4: And I have read one interview in which you mentioned lobbies in Washington DC. They are disturbing the policy change, you think so? President Assad: It’s very clear that the mainstream media, the different establishments, the different lobbies… this is one combination, one combination that they don’t need to see any change, because they have their own interest in the policy of the United States, in the destructive policy of the United States that we’ve been seeing at least for the last nearly 17 years since George Bush came to power in 2000. We only see the United States launching a war, directly or indirectly through proxies, and those different companies, lobbies, media, they have interest in this kind of problems. It could be financial interest in most of the cases. So, it’s very clear today that they are going to put obstacles and to impede any direction of the policy of the new President regarding either fighting terrorism or respecting the sovereignty of other countries, or even having detente around the world through the good relation with Russia, or with any other great power, like China, for example. Question 5: In the course of the fight against the so-called Islamic State, would you seek coordination with players like Turkey, Kurds, and the United States? President Assad: First of all, if you want to be very transparent, ISIS was created under the supervision of the United States, whether in Iraq in 2006; before it was ISIS, it was IS, Islamic State, it was in Iraq only, restricted to Iraq. Then when the conflict started in Syria, it became ISIS, of Syria and Iraq, and later Turkey sponsored this State, because they used to use the Syrian oil fields in order to export and to get money and to recruit more fighters, and Turkey was directly involved in the smuggling of oil, with the involvement and complicity of Erdogan himself with ISIS. So, we cannot expect to have genuine fight against ISIS by Turkey or the United States, and the recent, more stark example is the attack on Palmyra a few weeks ago, when they could retake Palmyra under the supervision of the Americans, under the surveillance of the American drones; they came through the desert and they occupied Palmyra. Today, we are talking, and ISIS has been attacking Deir Ezzor in the eastern part of Syria, and the Americans did nothing to stop ISIS. This is where the so-called international alliance against terrorism has been working for more than one year and a half now, and they achieved nothing, because they are not serious. For Turkey, Erdogan is Muslim Brotherhood, he’s instinctively and innately sympathetic and linked and close and adhered to the ISIS and to Al Qaeda because they have the same ideology, he cannot be away from them. He tries to do some maneuvers, to show that he’s against those terrorists, ISIS and al-Nusra, but actually on daily basis he supports those organizations, and without his support, they cannot survive. Question 6: In Aleppo, and elsewhere, your armed forces and Russian forces have been criticized for bombing residential areas, quarters, and hospitals from air. Would you say those human tragedies were inevitable to liberate Aleppo? President Assad: Actually, the ones who accused Russia and Syria about the bombardment or committing crimes and so on are the same countries who supported the terrorists, starting from the United States, UK, France, Turkey, Qatar, and Saudi Arabia, and other similar countries. Those who supported the terrorists directly through the media, through the politics, and through sending armaments and money and every logistical support, have no right to cry for the Syrian citizens, because they are the reason why the Syrian civilians, innocent people, have been killed during the last six years. This is first. Second, our role, as a government, by the constitution, by the law, and our moral obligation toward the Syrian people and the Syrian citizens, is to liberate them from the terrorists. Would anyone accept that a government would see any area in any country under the control of terrorists killing people and destroying everything and implementing their hateful ideology, the Wahabi ideology, on the people, and expect the government to stand by and watch? Of course, if you want to talk the casualties, every war has casualties, every war is a bad war. Every war has blood and killing, every war, any kind of war; you cannot talk about good war, this is self-evident. But if you have to resort to a war to fight terrorism, you will have casualties, unfortunately. We did our utmost not to have any casualties, but those who’ve been out crying for the civilians, did they present any shred of evidence about Syria killing civilians, or Russia? The other question: how can a government morally kill its own people? And if we kill our own people, the civilians, how can we withstand six years, as a government or as army or as President? This is not logical, this is not realistic. We are here because we have the public support. But at the end, as I said, there’s always casualties, and we hope that we can really end this war as soon as possible; this is the only way that we can save Syrian blood through. Question 7: Your force has been suspected to be using bombs containing chlorine gas. Would you deny it? President Assad: Actually, you are talking about chemical weapons, talking about chemical weapons means killing thousands of people in very short time, something that hasn’t happened in Syria since the beginning of the crisis. But the most important thing is that morally, as a government, you wouldn’t do it, you wouldn’t, as I just said, kill your own people, you wouldn’t use mass destruction weapons against your own people, that’s impossible. But third, which is more important, is that in 2013, we signed on the treaty of the banning of chemical weapons, and we gave up our arsenal of chemical weapons since 2013, and we don’t have it anymore. But actually, the terrorists are the ones who used those kinds of armaments, the first time in 2013, and in the spring of 2013 we asked the United Nations to send a delegation for investigations, and the Americans blocked our attempt, because they knew that time that if the delegation came to Syria, it will find the concrete evidence that the terrorists have used chlorine gas against our soldiers. So, I will completely deny what’s in this statement, which reflects the narrative, the Western narrative, regarding Syria, and this is part of demonizing the Syrian government and the Syrian Army. Question 8: There are millions of refugees and IDPs, including small children, hundreds of thousands of deaths. How do you think of responsibility as President? President Assad: Of course, when you talk about refugees, it’s a tragedy, when you talk especially about children, young children, youths, they are innocent people, they don’t have anything to do with this war, regardless of the affiliation. Actually, when you talk about children, they don’t have any political affiliation; they are just innocent people, but they are the ones who pay the price before any other one in the society. So, you’re talking about a tragedy we’ve been living with on daily basis. That’s why that feeling that I’m talking about, that we live with every day, is the incentive for us as officials to do our utmost to get rid of the terrorists who created this problem, and to bring peace and stability back to Syria. That’s the question that the Syrians ask to the President. Of course, as a Syrian, I’m sympathetic with every Syrian who suffered because of the war, but their question now is not what you feel; their question is what are you going to do? When are we going to get rid of those terrorists? But the most important aspect that many in the West and the world don’t mention is that part of the refugees problem is not only related to the terrorists themselves; it’s related to the embargo that’s been implemented on the Syrian people by the West and their allies. This embargo didn’t work against the government; it worked against every Syrian citizen, it affected the life of every Syrian citizen. That’s why many refugees left their country, not only because of the threat of the terrorists, but actually because the basic needs of their life, of their livelihoods, are not available for them to continue their normal life, whether food, whether education, healthcare, anything, it’s not available anymore, so they have to leave Syria to live somewhere else to live the minimum of the life that anyone would seek. Question 9: Then, in course of the peacemaking process, would you consider your resignation as an option, when you think it’s necessary for reconciliation? Question 10: What role would you expect Japan to play in peacemaking and rebuilding Syria; reconstruction and rebuilding Syria, Japan’s role? President Assad: Let me be frank with as a Japanese guest in Syria: since our independence, since the launching of the relation between Syria and Japan decades ago, Japan played a very important and vital role in the development of different countries including Syria; supporting the infrastructure, etc. And Japan was always unbiased regarding the different issues concerning the Middle East. It always respected the international law till the beginning of this crisis it was the first time for Japan to breach this trend when they say that the Syrian President should go. The question: is it based on the values and morals of the Japanese people? Definitely not. Everybody knows how morally-motivated the Japanese citizens are, everybody knows it. Is it based on the international law? No, we are sovereign country, we are an independent country, no one in the world has the right to say who should stay and who should go. Unfortunately, that was in line with the American and Western policy. Again, Japan joined the embargo on Syria, Japan used to help the Syrian people. Is the embargo on the Syrian people related to anything regarding the interests of the Japanese people or their values or their laws, or their constitution or anything? I don’t think so. So, how can Japan play that role while they don’t have embassy so they don’t see what’s going on here? Actually, politically, they are blind like so many Western countries that they don’t have any relation with our government or with our country, so they cannot play any role because they don’t know what’s going on. Their information is coming from Western countries, which is absurd for us. Reconstruction of Syria, you cannot talk about reconstruction while you are making an embargo; you cannot give me the food with one hand and take it from me with the other hand. So, it’s about the politics of the Japan; they have to go back to the international law, we are sovereign country, they always respected Syria, and we expect them to go back to that line that distinguished Japan from most of the countries around the world. This is where Japan can, of course, definitely, play an important and vital role regarding the peace and saving blood, and the reconstruction of Syria to help those people. Most of the refugees, they don’t need somebody to tell them “you’re welcome” to Germany or to France or to any other country; they want to go back to their country, they don’t want you to help them there, they want you to help them here. That’s how we see the role of Japan in the future, and we have hope that Japan will go back to the Japan that we used to know during the previous decades. Journalist: As you know, Japan has experience and role in nation building seventy years ago, Japan may advice to your country’s rebuilding and reconstruction. President Assad: Definitely, of course. We hope so. Question 11: As you know Japanese journalist Jumpei Yasuda, he’s very capable journalist, he’s my friend, has been captured in Syria since June 2015. Do you have any information of his whereabouts and situation? President Assad: Till this moment no, we don’t have any information about him. We feel sorry about this and we are, as Syrians, the ones who can understand the feeling of his family, because we have so many missings in Syria; many Syrians have been missed during this war, and we understand the feeling of his family, and we feel sorry for that. But if there is any information, I would have given it to you. Journalist: He is kept hostage by al-Nusra Front. President Assad: I think the one who can help in bringing the information are the Turks, because they are the supervisors of al-Nusra; they must have every information al-Nusra have, with their intelligence and their government. Journalist: And has Japanese government contacted your government? President Assad: Unfortunately, no. There is not a single contact between the Syrian government and the Japanese government regarding any subject, including this Japanese journalist, who is a Japanese citizen at the end. Question 12: You defined the Japanese role through their… Japan is belonging, you think, belonging to the coalition member of the United State, you think? President Assad: But the question: what did that coalition achieved, actually, nothing. ISIS was expanding since the beginning of the airstrikes, which were cosmetic airstrikes, I’m being very frank with you, till the Russians intervened against ISIS, the end of September 2015, where ISIS started to shrink. So, that coalition achieved nothing; they only killed Syrian soldiers who have been fighting ISIS in that area, they destroy the infrastructure of the Syrians that has been built during the last seventy years since the independence, in every sector of that infrastructure, whether the oil fields, schools, bridges, refineries, everything has been destroyed by that coalition. This is the only achievement of that coalition, unfortunately. Question 13: Your plan to rebuild this country, how long does it take? Your timetable? President Assad: We have started before the end of the crisis, we put the plans and we started with suburbs around Damascus and now we are planning in Aleppo and other cities to reconstruct new suburbs that’s been destroyed, but in a modern way. So, we haven’t waited, and we are not going to wait till the end of the crisis; we can start right away, as the Syrian people are determined to rebuild their country. We built Syria, Syria was not built by any foreigners; we built it with our engineers, with our labors, with our own resources, with the help of some friends – financial help, not technical help. So, we have the ability to rebuild Syria. It takes time because it needs a lot of money. The Syrians, every Syrian is going to build his own house according to his resources even if it is limited, you have expatriates, you have the refugees who left Syria, some of them are in good condition, they want to come back, and with the support of our friends Russia, China, and Iran. Many other countries started discussing the reconstruction of Syria, and they’re going to help with their financial resources. So, you have so many resources to rebuild Syria. It’s not about time; it will take time. Any reconstruction will take time, but the most important thing is that you have the ability to rebuild your country. We are not worried about that. What we are worried about is how can we rebuild the minds of the people that have been under the control of ISIS and al-Nusra for many years; that their minds have been polluted because of the instilled ideology in their minds, this, as I said, as I called it, hateful or Wahhabi Ideology. They saw the death and the killing, and some of the children killed with their hands innocent people. How can we rebuild those minds, or rehabilitate those minds? That’s our big concern after the crisis. Journalist: Thank you, thank you so much.